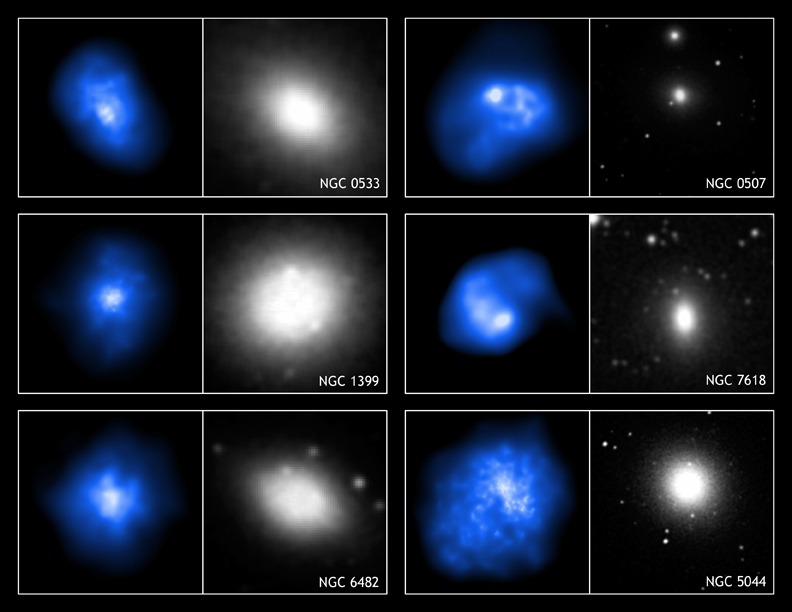 Chandra images of 56 elliptical galaxies have revealed evidence for unsuspected turmoil. As this sample gallery of X-ray (blue & white) and optical (gray & white) images shows, the shapes of the massive clouds of hot gas that produce X-ray light in these galaxies differ markedly from the distribution of stars that produce the optical light. Except for rare cases, most violent activity in isolated elliptical galaxies was thought to have stopped long ago. Elliptical galaxies contain very little cool gas and dust, and far fewer massive young stars which explode as supernovas. Thus it was expected that the hot interstellar gas would have settled into an equilibrium shape similar to, but rounder than that of the stars. Surprisingly, this study of elliptical galaxies shows that the distribution of hot gas has no correlation with the optical shape. A powerful source of energy must be pushing the hot gas around and stirring it up every hundred million years or so. Although supernovas are a possible energy source, a more probable cause has been identified. The scientists detected a correlation between the shape of the hot gas clouds and the power produced at radio wavelengths by high-energy electrons. This power source can be traced back to the supermassive black hole in the galaxies' central regions. Repetitive explosive activity fueled by the infall of gas into the central supermassive black hole is known to occur in giant elliptical galaxies located in galaxy clusters. Scientists' analysis of the Chandra data indicates that the same phenomena are occurring in isolated elliptical galaxies as well. 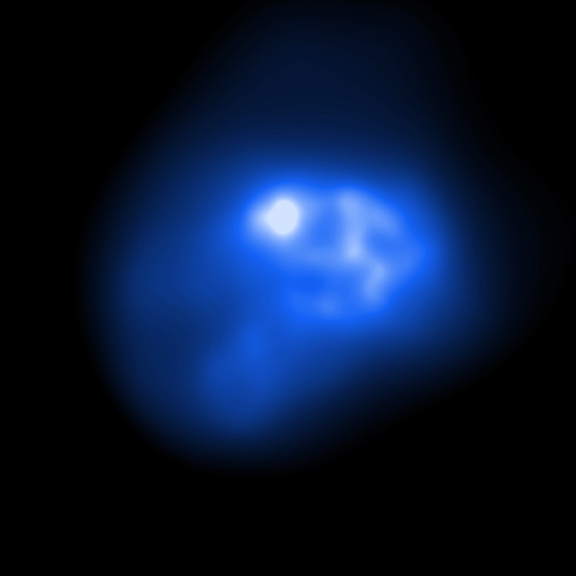 Scale Image is 3.4 arcmin across. Coordinates (J2000) RA 01h 23m 39.00s | Dec +33º 15' 24.00"
Scale Image is 4.75 arcmin across. Coordinates (J2000) RA 13h 15m 24.00s | Dec -16º 23' 06.40"
Coordinates (J2000) RA 03h 38m 29.40s | Dec -35º 27' 00.40"
Scale Image is 1.4 arcmin across. Coordinates (J2000) RA 01h 25m 31.40s | Dec +01º 45' 32.80"
Scale Image is 2.4 arcmin across. Coordinates (J2000) RA 23h 19m 47.30s | Dec +42º 51' 07.70"
Scale Image is 1.45 arcmin across. Coordinates (J2000) RA 17h 51m 48.90s | Dec +23º 04' 19.00"